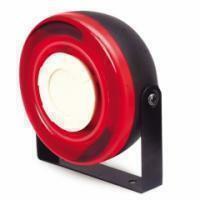 LD-85U Outdoor Sounder Beacon is convenient for indicating emergency and fire. This sounder with strobe can be used as a standalone device or integrated into any security system for visual and audible warning. It Has a U-shaped stand with screwholes for fixing onto wall, ceiling, equipment, device or tranportation. Siren can be turned to change the direction of the audibility and visual. This combined sounder beacon can be used for many different application such as deterring intruder, indicating emergency, and alerting danger. For the hearing impaired individuals, our pioneering strobe design allows for maximum coverage, dispersing light to all angles. This ensures that you will use the minimal number of device to achieve the maximum performance. This alarm is suitable for both indoor and outdoor use.